UpFront with NGS: Vision -- something we take for granted. What did our ancestors do? Vision -- something we take for granted. What did our ancestors do? The other day my husband and I were talking about my poor eyesight. I’m not blind and let’s say that without my glasses my whole world (except at about 4 inches from my nose) is a complete blur. My vision is good enough to get me to the bathroom in the middle of the night and read in bed and that is about it. This came to mind because I was mulling over signatures – you know, those things that we compare to see who is who when we have more than one individual living contemporaneously with the same name. And I got to thinking about vision ... or, really, the lack thereof. Yes, we may see images of Benjamin Franklin wearing his spectacles and do we honestly think that all our ancestors were running around wearing glasses? I imagine that there were many many people running around with blurry vision – maybe not as bad as mine and some even worse! During this period, spectacles also came into more common use in the United States. John McAllister, Sr. (1753-1830) arrived in America from Glasgow, Scotland in 1775 just before the Revolutionary War. He began selling hickory walking sticks (canes) in 1783 and, soon thereafter, riding whips. 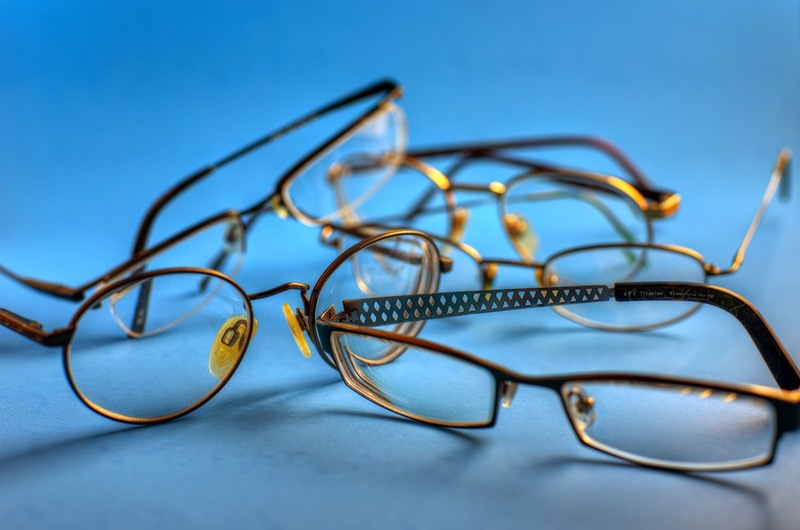 In 1799, he decided that spectacles might be an appropriate addition to these other wares so he established the first optical shop in America in Philadelphia. Until the War of 1812, McAllister imported all of the spectacles he sold in his shop. However, as a result of the conflict, the major trade embargo with Great Britain forced all Americans to rethink their dependence on imported goods. McAllister, a perfectionist, began producing his own gold and silver frames in 1815. Astigmatic lenses came into being in the U.S. in 1828 when McAllister and his son John, Jr. began importing cylindrical lenses for the correction of astigmatism. So, pre-1799, getting spectacles was really hard. And, post-1799, I don’t think too many North Carolinians (where I live) were traveling to Philly to get eyeglasses! Then, what about hitting the age of 40 (I did hold out until 45 and then that switch flipped off) and all of a sudden many of us lose our near vision, hence have trouble reading. What about glaucoma and cataracts? So, not only have I lost my near vision, I’m now at risk for cloudy vision, reduced vision, or possibly a loss of vision. To be honest, I cannot imagine what life was like with everything a blur for a person with reduced vision – can you imagine working in a kitchen over a hot fire? What about sewing, chopping wood, grabbing containers of “stuff” for which you cannot read the labels, etc. In addition to the household and work hazards that come with poor vision, now imagine that you are asked to write your signature! I cannot imagine what my signature would like if I couldn’t “see” to write it, though I can guarantee that it wouldn’t be as neat (a matter of opinion) as it currently is. So, though, I have often thought that a person might switch from writing a signature to making a mark as they write their will due to being feeble, injured, or otherwise incapaticated, it’s also very likely that someone who had a glorious signature in youth may have found it impossible to have the exact same signature as their vision deteriorated. Keeping with the theme of signatures, I also know that my signature has morphed through time. Where I used to write with a somewhat cramped style, with the passage of time my signature got a bit more dramatic (though my husband and daughter I think were aiming for the unintelligible writing associated with doctors). I actually kind of have fun writing my name – after all, signing credit card receipts and contracts is about the only practice I get! Since I’ve worn glasses since I was five, I imagine that without the aid of glasses, my signature would have been quite different than it is. I’ve realized the though I have understood the value of signatures, I may not have fully understood the complexity of the signature of any given person when correlated to vision issues. I take for granted my glasses (as invaluable as they are). What if I didn’t have any?